David Schlosser focuses with Jedi determination on a type of cuisine known as kappo, which in Japanese means something like “to cut with a kitchen knife and cook with fire.” The chinmi, or “rare tastes,” at this downtown restaurant, located on the ground floor of a multilevel parking garage, might include lobster fermented in its tomalley (i.e., guts), jellied sea bream skin, and irizake—pickled plum cooked with sake that was a common condiment before the mass production of soy sauce. In kappo fashion Schlosser creates his elaborate meals at a counter in view of guests. 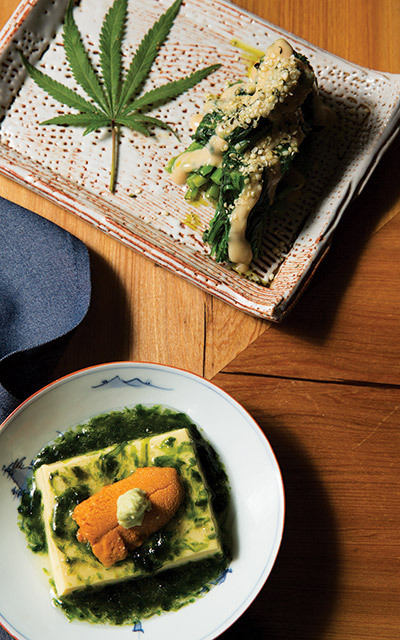 Details reflect the chef, and here they extend to the cypress bar’s brass joinery, glasses with thread-thin stems, and the occasional dish served in a Meiji-era bowl. —B.H.